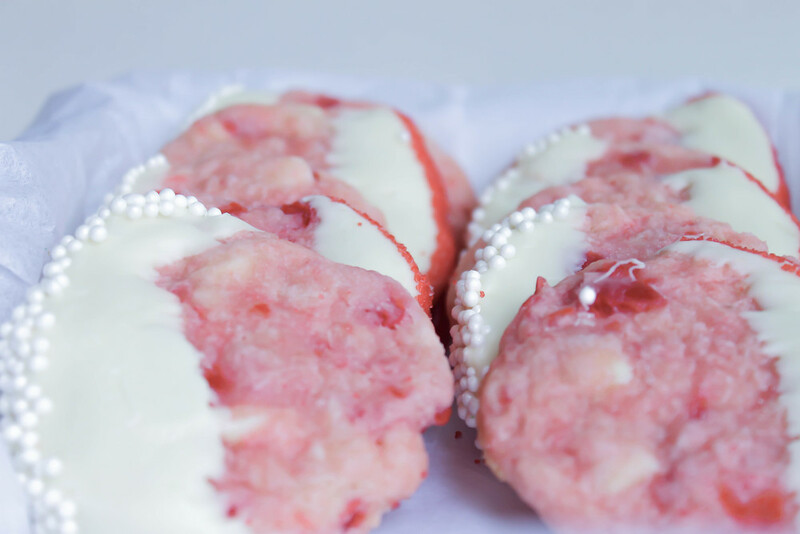 These white chocolate cherry shortbread cookies are also new to me. I just couldn't resist them since they look so festive and pretty! In a large bowl, combine flour and sugar. Using a pastry blender, cut in the butter until mixture resembles fine crumbs. Stir in drained cherries and 4 ounces (2/3 cup) of the chocolate. Stir in almond extract and, if desired, food coloring. Knead until smooth and form into a ball (dough will be crumbly at first, but will come together as you work the dough with your hands). Shape dough into 3/4-inch balls. Place balls 2 inches apart on an ungreased cookie sheet. Using the bottom of a drinking glass dipped in sugar, flatten balls to 1-1/2-inch rounds. Bake in preheated oven for 10 to 12 minutes or until centers are set. Cool for 1 minute on cookie sheet. Transfer cookies to a wire rack and let cool. In a double boiler, melt remaining 8 ounces of white chocolate. Cook and stir until melted. Dip half of each cookie into chocolate, allowing excess to drip off. If desired, roll dipped edge in edible glitter/sprinkles. Place cookies on parchment or waxed paper until chocolate is set. Hope you are enjoying these cookies! These ones are absolutely perfect for the holiday season with their bright, pretty color. They taste pretty yummy, too!